The upstream devel list suggests that issue (a)  has been resolved in version 1.2.3 which is currently only in Debian unstable via version 1.2.7. I can't find the actual bug supposedly filed by 'Ronie Gilberto Henrich'. I have not tested 1.2.7 as it is not easily available to me. This bug is a request to have fixes for both issues ( for (a)) introduced into Ubuntu 12.04. Note the .103 server remains. Note the original weight of '1' for .102 server remains. Note the .103 server does not remain. This introduces the proper behavior for comparing ipv4 addresses. We may see issues where keepalived was working in an environment and after upgrade fails. This probably indicates that the environment may have issues outside of keepalived as the previous behavior was incorrect. Accepted keepalived into raring-proposed. The package will build now and be available at http://launchpad.net/ubuntu/+source/keepalived/1:1.2.2-3ubuntu2.13.04.1 in a few hours, and then in the -proposed repository. Accepted keepalived into quantal-proposed. The package will build now and be available at http://launchpad.net/ubuntu/+source/keepalived/1:1.2.2-3ubuntu2.12.10.1 in a few hours, and then in the -proposed repository. Accepted keepalived into precise-proposed. The package will build now and be available at http://launchpad.net/ubuntu/+source/keepalived/1:1.2.2-3ubuntu1.1 in a few hours, and then in the -proposed repository. I redid both tests (description) and re-confirmed both failures. I then installed the -proposed version below and re-did the tests. They both passed. Obviously, the above verification was done for Precise. I will soon do the same for Quantal and Raring. Ditto for Quantal - all good. There is something seriously wrong with the Raring package. Starting keepalived caused my system to lock up. The same happened after trying it on a few different platforms. My last attempt was with a traditional KVM guest. 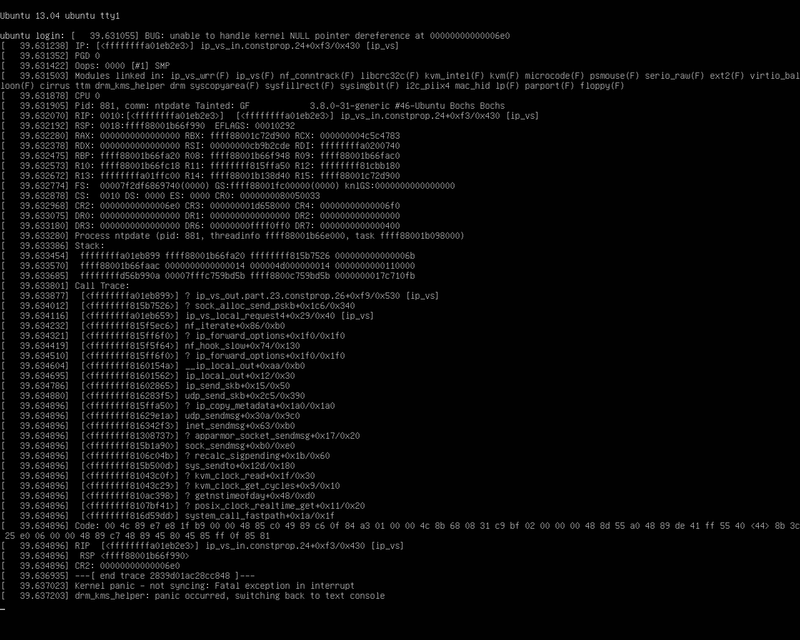 After the freeze I reset the guest and I was able to capture a screenshot of a kernel panic. Hm, I tried again and it installed ok. I need more time to verify this. Don't know what's going on. 500 http://nova.clouds.archive.ubuntu.com/ubuntu/ raring-proposed/main amd64 -- maybe use the default archive to do your test instead of nova.clouds? On a KVM guest the freeze happens upon starting the normal (non-proposed) keepalived. The patched kernel linked there fixes the issue. Confirmed. Once the henrix kernel  is installed the new keepalived on Raring works. Let me clarify. Once the henrix kernel is installed, the normal and proposed keepalived can be installed and tested.